GREENBELT, Md. — This past week, on Wednesday, November 2, NASA celebrated the completion of the OTIS (Optical Telescope, plus Integrated Science instrument module) portion of the James Webb Space Telescope (JWST) during a “Golden Mirrors” media event in Building 29 at the agency’s Goddard Space Flight Center (GSFC). SpaceFlight Insider was on site for the event. “This was a long time coming, and a long time coming because it’s so complex,” explained NASA’s Administrator, Charlie Bolden. “Two decades of innovation and work and this is the result. We are opening a whole new territory of astronomy. 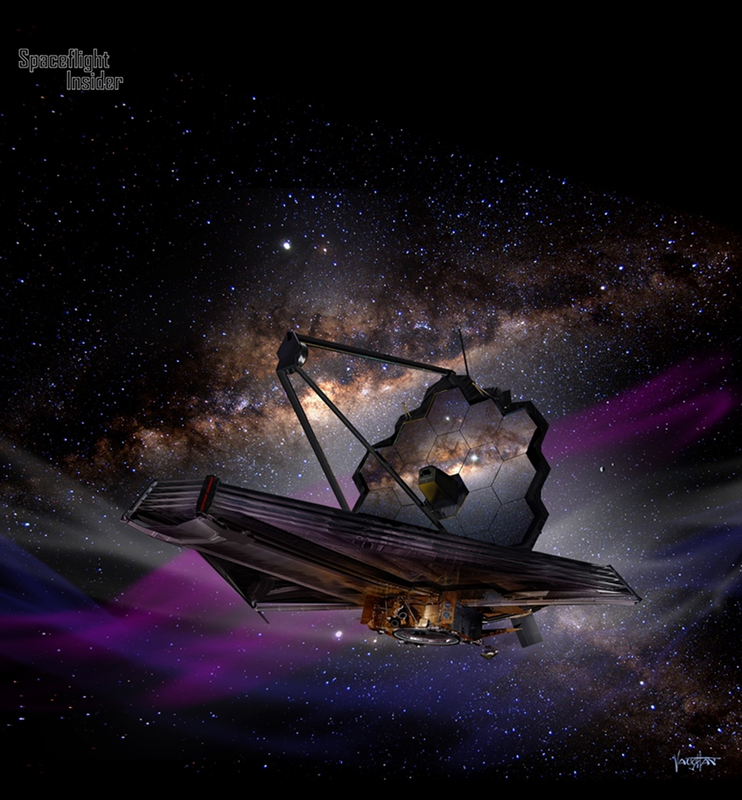 We will see things that we’ve never been able to see before, because this telescope is much more powerful than even the great Hubble Telescope,” added John Mather, Nobel laureate and Senior Astrophysicist at GSFC’s Observational Cosmology Laboratory. “We’re putting it a million miles from Earth and it’ll be overhead at midnight – so Sun, Earth, and telescope [are] in a row. We orbit around that spot because we actually don’t want to be in the shadow of the Earth – we need solar power. “Number one, it’s gigantic. 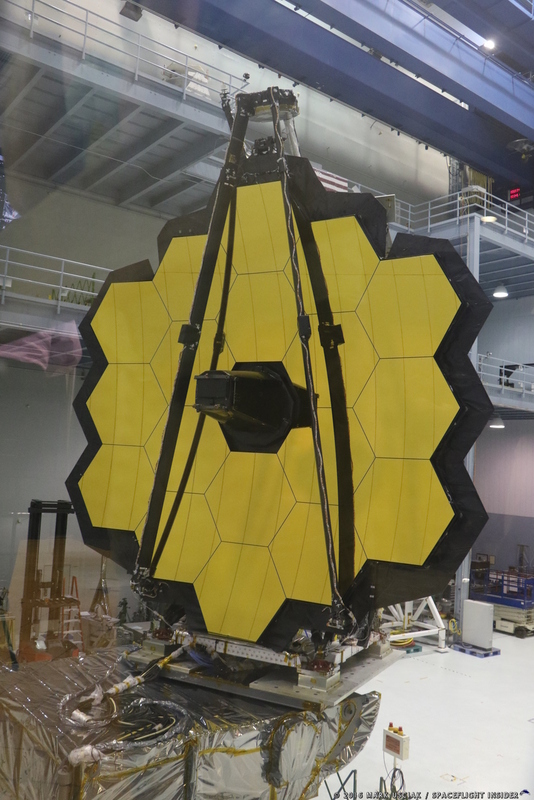 You can see this beautiful gold telescope is seven times the collecting area of the Hubble Telescope, so that’s the beginning. “The second thing is that it is designed to collect infrared light. Infrared light is something you cannot really see with your eyes. The Hubble Telescope can see a little bit of it, but it’s [(Hubble)] not cold, so the Hubble Telescope glows – it emits infrared light itself – so you can’t use it to do all of the things that astronomers have identified as their next priority. GSFC engineers recently completed a “Center of Curvature” test on the 18-segment primary mirror to confirm its proper alignment. 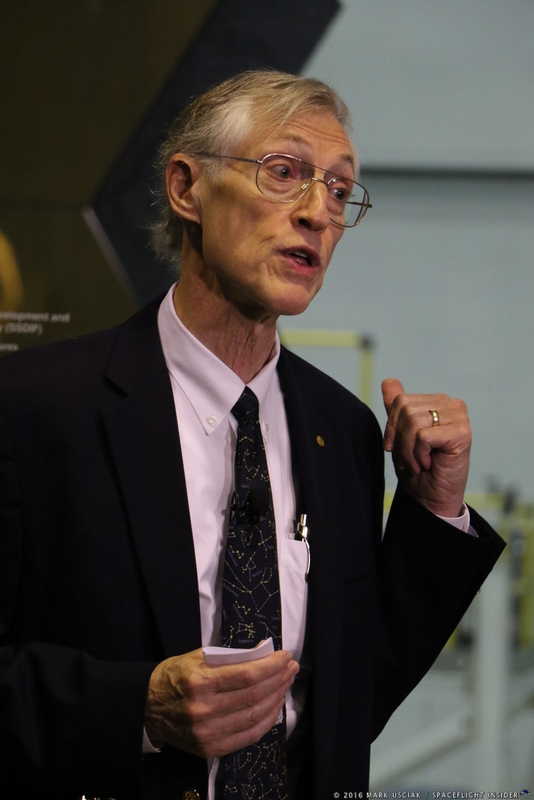 The JWST OTIS will now undergo low-frequency vibration testing to simulate anticipated launch conditions. This testing will begin on Nov. 21, 2016, and last approximately three weeks. Beginning the second week of December, OTIS will be subjected to rigorous acoustic testing to further simulate launch conditions. Upon completion of vibration and acoustic testing, engineers will inspect OTIS to confirm that it hasn’t been damaged. Then, in February 2017, OTIS will be packed up and flown, via Lockheed Martin’s C-5 Galaxy, to Houston’s Johnson Space Center (JSC) for cryogenic and vacuum testing. This testing (along with pre and post-test activities) is expected to last 90 days. After that, in late summer 2017, OTIS will again be packed up and flown (by C-5) to Northrop Grumman‘s Space Park facility in Redondo Beach, California, to be mated with the spacecraft bus and sunshield. Assembly and testing, at Northrop Grumman, will continue until the summer of 2018 and, at that time, the completed JWST will be placed on a ship and transported, via the Panama Canal, to the launch site in Kourou, French Guiana. For more SpaceFlight Insider photos from the “Golden Mirror” event, click here.